➤ Nepal is a country of amazing extremes, home to the worlds highest mountains, historic cities and forested plains where tigers and rhinos trundle at ease. In fact enchantment is everywhere for anyone in search of Shangri-La. ➤ After Breakfast proceed to Pokhara. 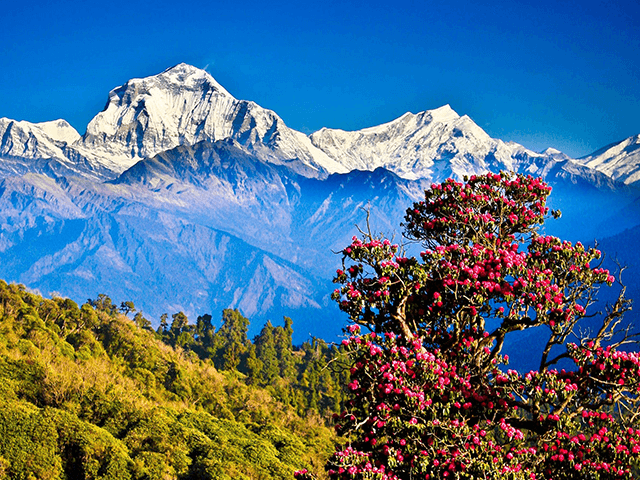 ➤ Pokhara - Pokhara valley is one of the most picturesque spot of Nepal. The beauty of Pokhara is enhanced by its lovely lakes, which have their source in the glacial region of the Annapurna range of the Himalayas. Pokhara is the only place in the world to provide such a dramatic views in a sub-tropical setting. Machapuchre, for example, is only 28 km from Phewa Lake and not a single mountain range intervenes between the two. ➤ Phewa Lake - The second largest lake in the Kingdom, is the center of all attraction in Pokhara. It is the largest and most enchanting of the three lakes that add to the resplendence of Pokhara. Here, one can sail or row a hired boat across to the water or visit the island temple in its middle. The eastern shore, popularly known as lakeside or Baidam, is the favorite home base for travelers and is where most of the hotels, restaurants and handicraft shops are located. ➤ Arrive Pokhara, check in, lunch at Hotel. ➤ Evening, enjoy a boat ride on the Phewa Lake set against a fish-tail summit rising over 6,900 m.
➤ Lunch, Dinner and overnight at the Hotel. ➤ Rise early to take a short hiking trip to Sarangkot (subject to weather, which takes an hour to reach to the top to view a panoramic view of the sunrise on the Annapurna range. Return to hotel for breakfast. ➤ Later proceed on a sightseeing tour to Pokhara . Visit Gupteshowre Cave, where you will find a statue of the Hindu God, Shiva. It is said that this statue formed naturally by the following waters of the cave. Also visit the David's Fall where you can see a waterfall appearing from nowhere into many pools and finally disappearing after flowing through small cascades into cracks in the ground. ➤ Rest of the day at leisure to enjoy the serenity of the mountains. ➤ After Breakfast proceed to Kathmandu. ➤ After Lunch visit Bhaktapur City that still retains a medieval charm and visitors are entreated to myriad wonders of cultural and artistic prides. It is like going back to the 17th century. The movie 'Little Buddha' was filmed in this city. ➤ Thereafter drive to Nagarkot located at an altitude of 2,175m. Nagarkot is known as the Himalayan Village on Top of The World. This place used to be the nature retreat of the royals with its unobstructed mountain panorama, which extends from Annapurna in the west to Everest in the east. Bask in the pleasant climate. ➤ You will be taken to the lookout point to have amazing sunset views. ➤ Early morning rise to enjoy the sunrise and lose yourself in the lush greenery. ➤ Thereafter proceed for the tour of Pashupatinath , the majestic temple with golden roof. It is considered as being amongst the most important Hindu pilgrim center. Located on the banks of the Bagmati River one can even witness cremations taking place here. Visit Bungamati or Khokana Village. ➤ Later visit Bouddhanath . This colossal stupa is one of the biggest in the world and also serves as the center of Tibetan Buddhism. ➤ After lunch proceed on Sightseeing of Kathmandu City . Discover Durbar Square , which is presently known as Hanuman Dhoka, a name derived from the statue of Hanuman, the monkey devotee of Lord Ram. Many of the palaces and temples in Durbar Square were built during the reign of the Malla Kings and are beautiful examples of Newari Architecture, Nepal's most distinctive architectural style. Visitors to the Durbar Square of Kathmandu will be amazed by the architectural wonders spanning several centuries. This important historical attraction has been declared a UNESCO World Heritage Site. There are more than a dozen buildings and statues of note in this small area. They include: Kasthamandap the wooden building that is said to have given the city of Kathmandu its name , Taleju Temple one of the oldest temples in the square, this three-roofed temple with its pyramid shaped bases, is an example of the typical Newari architectural style. ➤ Visit The Living Goddess of Nepal . A living, breathing goddess called Kumari Devi. It is the custom of worshipping a pre-pubescent girl as the source of supreme power is an old Hindu-Buddhist tradition that still continues to this day in Nepal. ➤ Later proceed to Thamel Market for Bazaar Shopping. ➤ Late evening enjoy a superb cultural show with a typical Nepalese dinner . Overnight at Hotel. ➤ After Breakfast free for personal activities or at leisure till time to depart. ➤ *Arrive home with exciting memories of the Himalayan Kingdom!